This mall-located steakhouse shines with taste and tempting side dishes, an extensive wine selection and a seductive ambience. 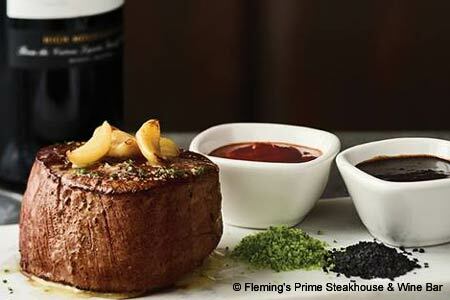 : If ever a link in a restaurant chain didn't feel like one, it's Fleming's Prime Steakhouse & Wine Bar in the Gateway Mall. Seated at large tables, the clientele looks refreshingly sophisticated amid the dim lights, cherry wood accents and walls faux-painted in rose and camel. Efficient servers deliver à la carte steakhouse standards such as a thick (but sometimes slightly bland) filet mignon and sides of huge onion rings and sautéed medleys of mushrooms. The lengthy menu is only upstaged by the wine list, which offers more than 100 selections by the glass, an anomaly in Utah. For dessert, ask your server for a slice of decadent chocolate turtle pecan pie, served with fresh Chantilly cream. For a casual happy hour experience, put Wine Wednesday's on your calendar. From 5 p.m.-7 p.m., the $15-per-person weekly event is a good way to network and brush up on your wine knowledge. Bonus: The wine gatherings benefit a new charity each month so your admission is tax deductible.